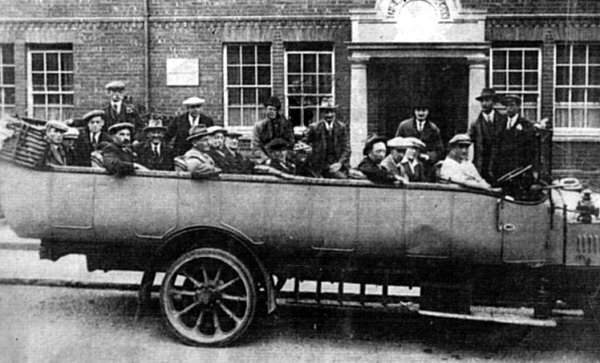 A charabanc was a type of early motor coach common in Britain during the early part of the twentieth century. The name derives from the French char à bancs meaning a 'carriage with wooden benches' since the passenger seating comprised of forward-facing wooden bench seats arranged in rows, with each row usually accessed by its own door in the side of the vehicle. They were almost always open-topped and open-sided, but invariably had a foldaway roof covering. Later models had side windows for the protection of passengers. Even so, the combination of wooden seats, solid tyres, primitive springs and the usual top speed of 12 mph must have made for a tiring, and somewhat uncomfortable, day out. 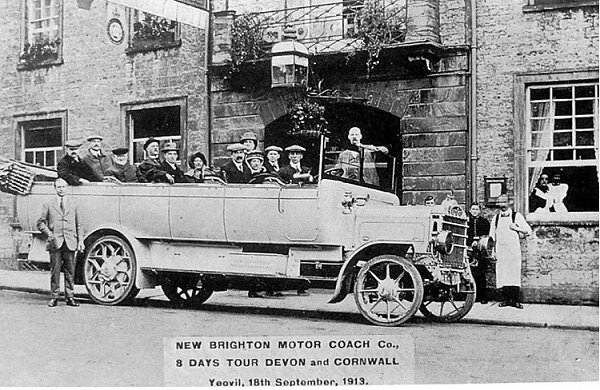 Yeovil had at least four charabanc operators; Bird Bothers, Barlow & Phillips, Edwin Purchase and Jesse Reeves & Son. 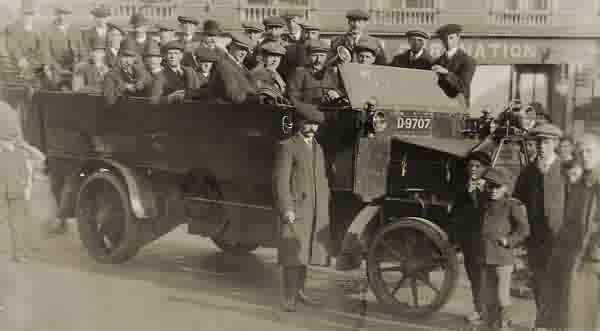 The main charabanc operator was Bird Brothers and many of the charabancs shown in the Gallery below are Bird Brothers' vehicles. The photographs show that they had at least four. The Gallery also shows a Bird Brothers' list of destinations and prices for 1931. The price, for example, of 5/9d for a day trip to Cheddar Gorge is the equivalent to about £18 at today's value. 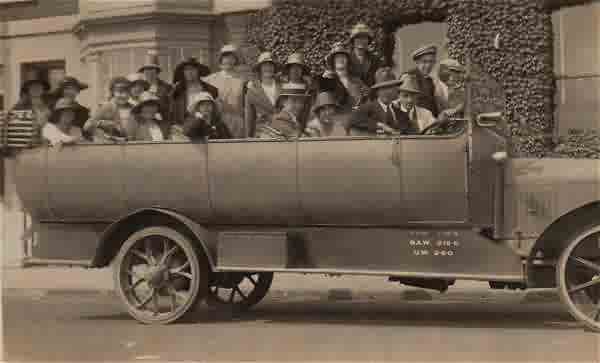 The charabanc was especially popular for sight-seeing excursions and annual 'works outings' to the countryside, major towns or the seaside. The most common period of use was up until the 1920s although some remained in use until the Second World War. 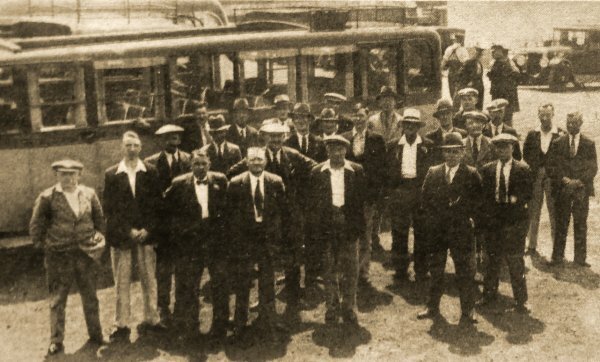 The word 'charabanc' was in common usage until the middle of the twentieth century but was deleted as obsolete from the pocket edition of the Collins Dictionary in 2011. Of course before there were motorised charabancs there were still staff outings. 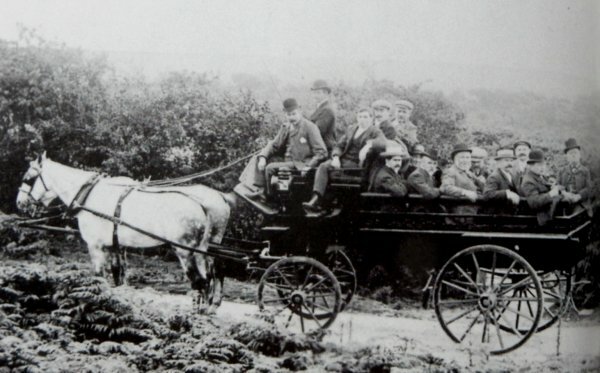 This photograph of around 1890 shows staff of Whitby Brothers glove manufactory on a day out to Batcombe Down in the horse-drawn version of a charabanc. 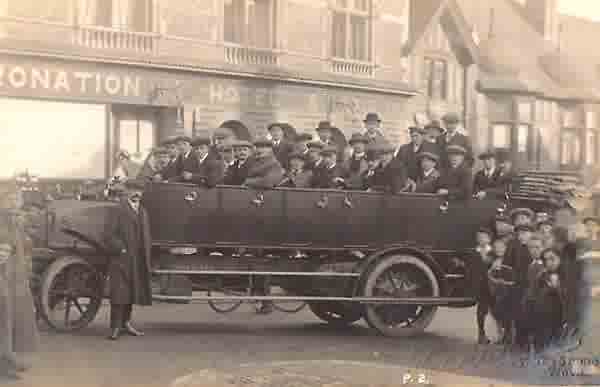 A very early charabanc - from a postcard sent in 1913. A staff outing stops for a photo outside the Coronation Hotel in the Triangle. 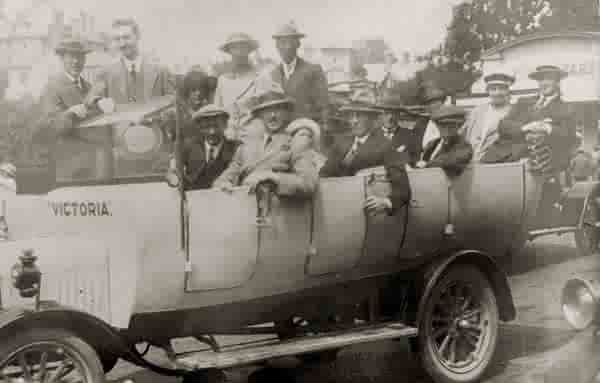 This is thought to be a photograph of Yeovilians on a day trip although the location of this photograph is unknown. On the chassis, between the wheels, is painted "Speed 12mph". Combined with solid tyres, wooden seats, primitive springs and a three-hour journey to, say, Cheddar Gorge some 36 miles away (a popular day trip destination for Yeovilians) it would have been a tiring experience and probably quite uncomfortable. Note the collapsible roof folded down at the rear of the vehicle. 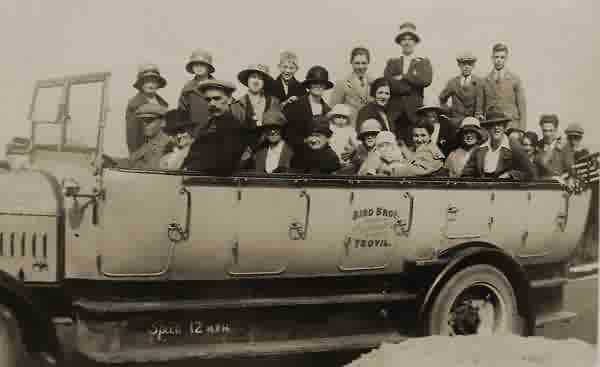 Yeovilians enjoy a 1920's charabanc outing. This photograph has been identified as being taken outside the Belle Vue Hotel, Pier Approach, Bournemouth. A lad's day out starting, stopping at or finishing at the Coronation Hotel in the Triangle. The photograph is by Walter Rendall. Again, note the collapsible roof folded down at the rear of the vehicle. 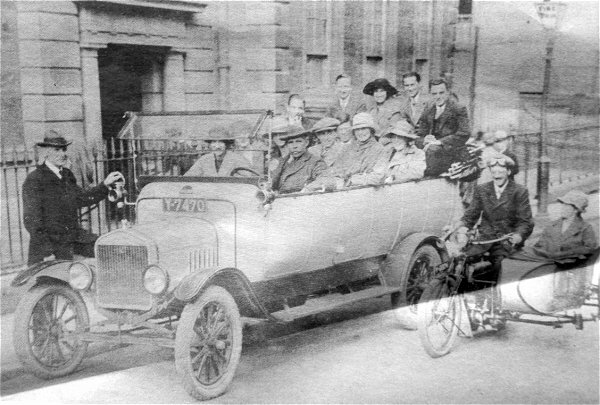 This photograph is from a newspaper cutting and shows a charabanc outing of the St Michael's Lodge, RAOB, outside the White Horse in the early 1930's. 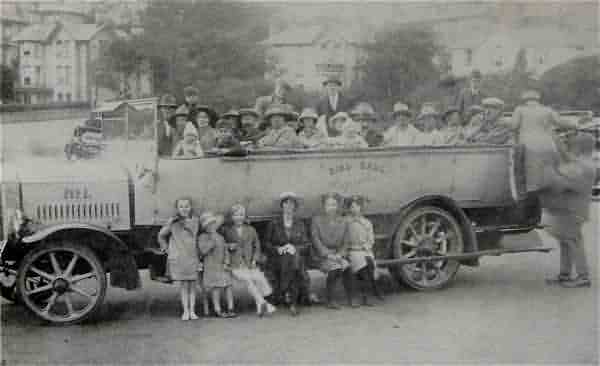 This charabanc was operated by Barlow & Phillips of Yeovil, who were primarily hauliers. A 1920's trip to Gough's Caves at Cheddar. 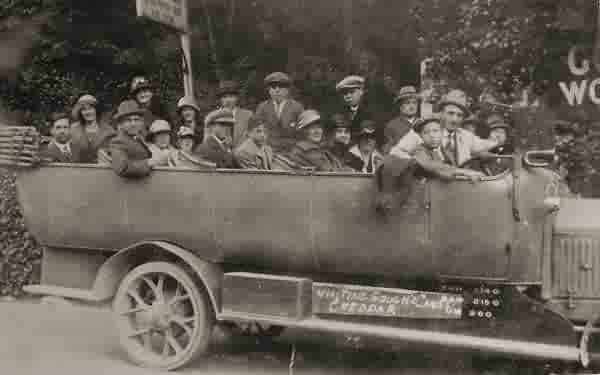 This charabanc was operated by Edwin Purchase and his son, Leonard Purchase, is the driver in this photograph. 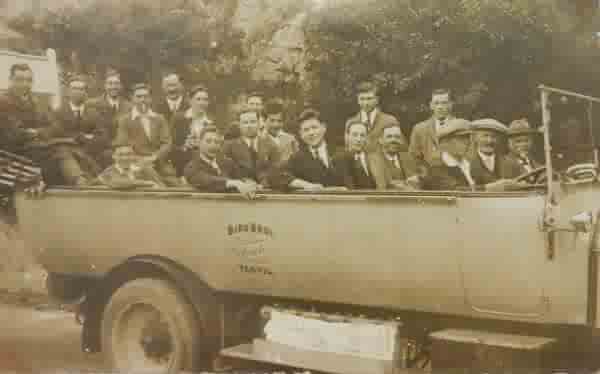 This looks like a factory outing, in another Bird Brothers of Yeovil charabanc. It appears from this, and the previous two photos, that this spot in Cheddar Gorge was the ideal spot to stop and have your photo taken. 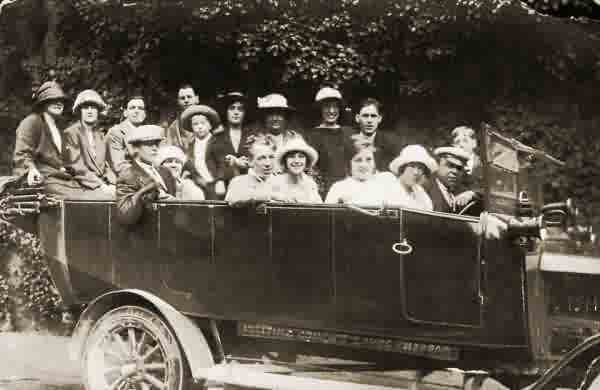 A 1920s outing visiting Gough's Caves, Cheddar. The two young ladies in the back seat were Patricia's father's sisters, Drusilla Olive Tucker and Louisa May Tucker - known to Patricia as Auntie Olive and Auntie May - of 2 Church Terrace, Silver Street. 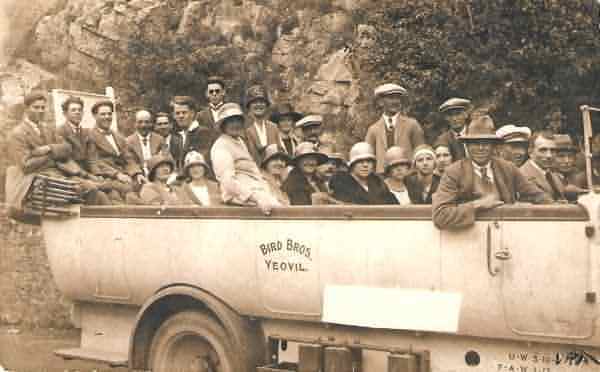 Yeovilians on a day trip in the 1920s stop for a photo (and liquid refreshment?) outside an unknown pub. 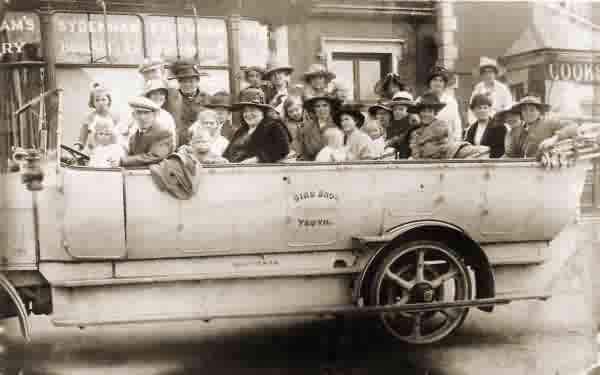 Another charabanc-load of Yeovilians off on another exciting excursion. 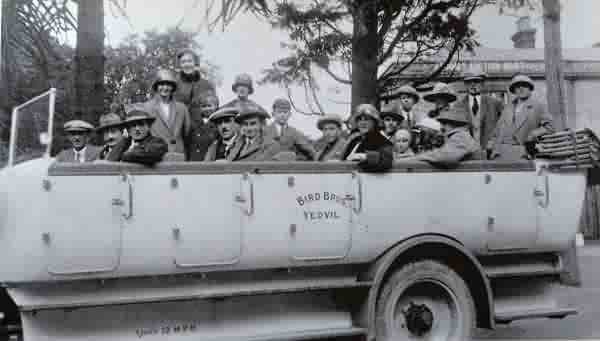 Yeovilians enjoy an outing in a Bird Brothers of Yeovil charabanc in 1926. .... and yet another Bird Brothers' outing. Same company, different charabanc. 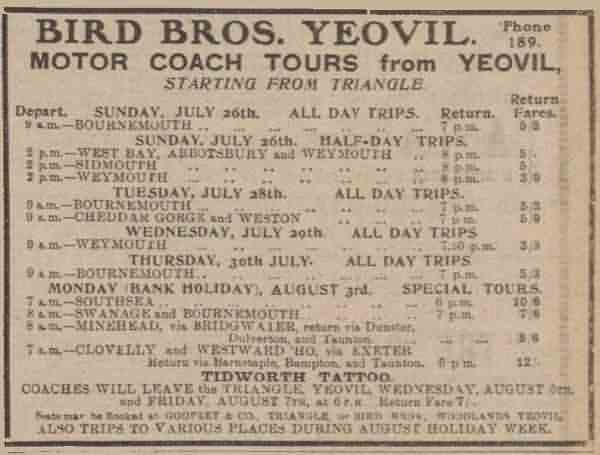 This Bird Brothers' outing was to Bournemouth and would have cost 5/3d in 1931. .... and this looks very much like the same Bird Brothers' vehicle. Yet another Bird Brothers' charabanc - this one looks to offer a little more protection for passengers with its side windows. The ladies' cloche hats would suggest the 1920s. A WJ & EG Ricketts & Co staff outing. 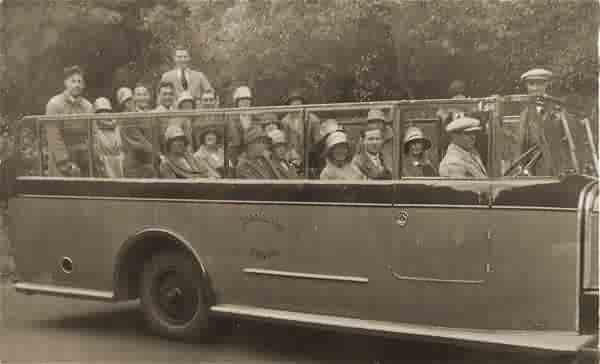 The charabanc has a much more enclosed passenger section - almost like a modern coach - but it still has side doors and a canvas roof that rolls up as seen here. 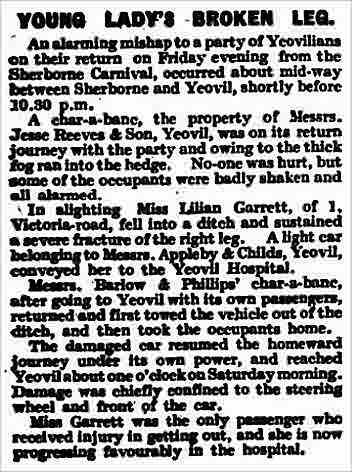 Also, of course, visitors to Yeovil frequently arrived in charabancs. 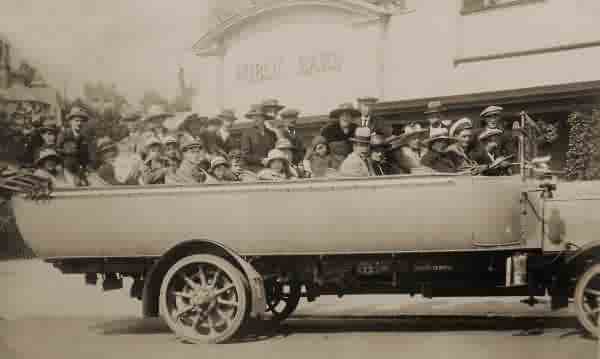 Clearly dated 1913 this photograph depicts a touring charabanc of the New Brighton Motor Coach Co. whose passengers enjoyed a night at the Three Choughs Hotel. Then, as now, hotel staff loved to get into the picture as seen at right. A report of a charabanc accident from the 12 November 1920 edition of the Western Chronicle. Bird Brothers' day excursion price list of 1931.